A growing number of U.S. legislators are urging a cut-off of U.S. aid to Egypt. Some of them took to the airwaves as Egypt’s interim government pondered outlawing the Muslim Brotherhood that is demanding the return of ousted president Mohamed Morsi. 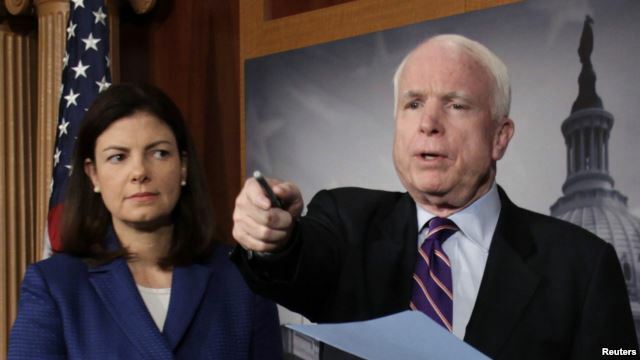 Last month, Republican Senators John McCain and Kelly Ayotte helped defeat a motion to suspend U.S. aid to Egypt. Sunday, both said they had changed their minds. Speaking on NBC’s Meet the Press television program, Ayotte said continued assistance is sending the wrong message to Egypt’s military after a week of bloodletting. “Now with the recent violent crackdown, I do not see how we can continue aid. I believe it must be suspended. Unfortunately, I think the military has gotten the impression that, whatever they do, we will continue our aid,” said Ayotte. Appearing on the same program, Democratic Senator Jack Reed said that recent events in Egypt demand a “change” in U.S. assistance. But he stressed that the United States must remain engaged in Egypt. Meanwhile, Republican Senator Bob Corker said he believes a reassessment of U.S. assistance is appropriate and that aid will be curtailed. But he said that the United States must not lose sight of its vital interests in Egypt and the broader Middle East. Corker spoke on ABC’s This Week program. U.S. law mandates a suspension of military aid after a coup, but the Obama administration has avoided using the term in describing Morsi’s overthrow. Also appearing on This Week was Democratic Congressman Eliot Engle, who said Egypt remains an “important” country and that the United States should not rush to suspend assistance.